PYONGYANG, North Korea -- Fifty years after it was seized by North Korea, the USS Pueblo is the only U.S. Navy ship held captive by a foreign government. And though mostly forgotten in the United States, the "Pueblo Incident" for North Korea remains a potent symbol of military success. The spy ship, attacked and captured 50 years ago this week, sits in the frozen Potong River on the edge of the sprawling "Victorious Fatherland Liberation War Museum" complex in central Pyongyang, where thousands of North Koreans are brought each day to hear the North's version of how their country, against all odds, defeated the Americans in the 1950-53 Korean War and has been fighting off the hostile Goliath ever since. Amid an escalating flow of rhetorical attacks on Washington for allegedly trying to sour North-South relations ahead of next month's Winter Olympics in South Korea, North Korea's state-run media have played up the anniversary as a milestone in the country's continuing struggle against the United States, now over leader Kim Jong Un's development of nuclear weapons and intercontinental ballistic missiles. 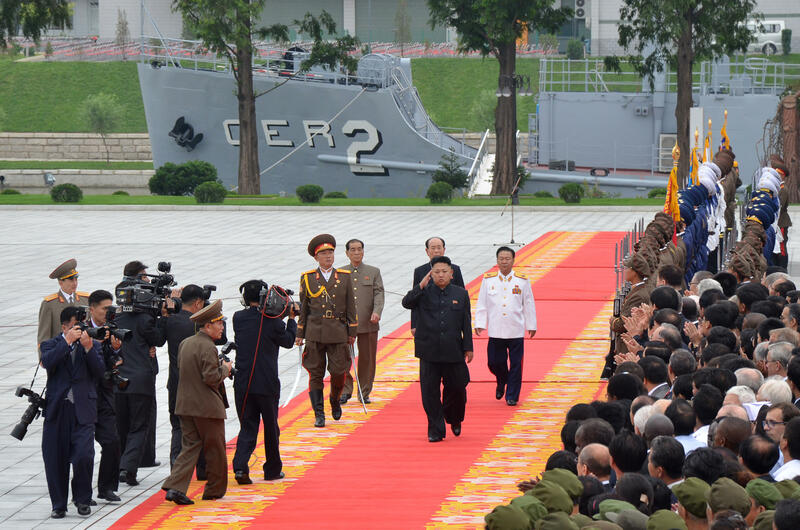 In a story commemorating the anniversary, North Korea's official news agency quoted a naval officer as saying the ship is a symbol of how the United States will suffer a "crushing defeat" if it infringes on the country's sovereignty. It said a student visiting the ship felt the "pleasant sensation of a victor" as he looked at photos of the American crew. The ship has been extensively refitted to heighten its dramatic impact. As Jang Un Hye, a military guide who has been assigned to the museum for the past two years, leads the way through the vessel, she points to bullet holes and shrapnel marks that have been freshly painted a bright red. She looks down with satisfaction at a crumpled American flag kept in a glass case on the bridge and waves her hand at copies of confessions hanging on the wall and placed atop metal tables that she says were handwritten by the Pueblo's captain and crew. North Korea claims the ship entered its territorial waters when it was attacked and Jang stands by a map near the ship's communication room that she says shows a dozen or so incursions made by the Pueblo before its capture. The ship's other visuals are mostly intended to underscore the American humiliation. There are grainy black-and-white photos of the captain signing a confession and of crewmembers walking across the Demilitarized Zone after their release nearly a year later. The Pueblo's cramped mess hall is used to show a short propaganda video. The Pueblo was ill-equipped for the fight it got on Jan. 23, 1968. One U.S. sailor was killed when the ship was strafed by machine gun fire and boarded. The 82 survivors were taken prisoner. The North Koreans released propaganda photos and videos that showed a number of the captured sailors raising the middle finger to the camera as a sign of protest. They told their captors, who were unfamiliar with the gesture, that it was a "Hawaiian good luck sign." Coming at the height of the Cold War, its capture escalated quickly and threatened to become a serious military conflict. The U.S. sent carriers to the Sea of Japan and demanded the captives be released. North Korea, for its part, forced members of the crew, who say they were beaten frequently, to make public confessions. The incident came to an end on Dec. 21, 1968, when Maj. Gen. Gilbert H. Woodward, the chief U.S. negotiator, signed a statement acknowledging that the Pueblo had "illegally intruded into the territorial waters of North Korea." He disavowed that before and afterward. On the official tours of the Pueblo today, however, that's not part of the narrative.